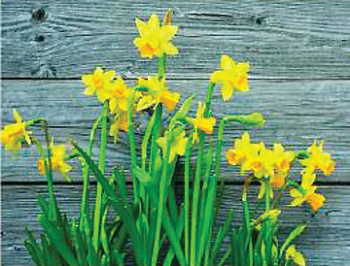 This April, the Canadian Cancer Society marks its 61st Daffodil Month by rallying Canadians to show their support for people living with cancer and honour those who have died by wearing a daffodil pin or buying fresh daffodils. Money raised through flower and pin sales during Daffodil Month fund critical cancer research, education and advocacy initiatives as well as compassionate support programs across the country. Volunteers will hit the streets in communities across Canada, canvassing door to door, selling pins and fresh cut daffodils and encouraging the public to give generously. Four out of five employed people who volunteer report that they feel better about their employer because of their employer’s support of volunteer activities. Volunteering with the society provides employees with the chance to make a positive impact in the community, the reward of knowing that their efforts help support, inform and empower those touched by cancer and meaningful opportunities for individuals, or to build teams through group volunteering. Aligning your volunteer program with the society will use your employees’ skills in new and rewarding ways, build stronger relationships among colleagues and renew a sense of social commitment. Group: Our goal is to work closely with you to coordinate a volunteer experience that matches your group’s needs. We offer our corporate partners opportunities to volunteer as a group in supporting one of our signature events or community campaigns, or assisting our staff and volunteers at our local community offices on a variety of activities or projects. Employees can make individual contributions as a volunteer while being supported through the company. Individual opportunities during business hours include project based work where expertise can be applied, event planning, campaign support, advocacy support or office support. While the society has a number of pre-determined placements for volunteer involvement, we recognize that some have a desire to contribute specific skills or expertise. If your team is interested in contributing in a customized way, our volunteer engagement staff are here to help connect you to individual or group opportunities that are well suited. Contact us today and explore the possibilities.